Lord Sastha carries a form that is different from other deities. Sastha occupies a unique position in the Hindu pantheon as being the son of the two gods, Siva and Vishnu. Sastha therefore combines in himself the main aspects of Hindu culture, the saivite and vishnavite, and symbolizes their inner unity as well as the inner unity of his parents. 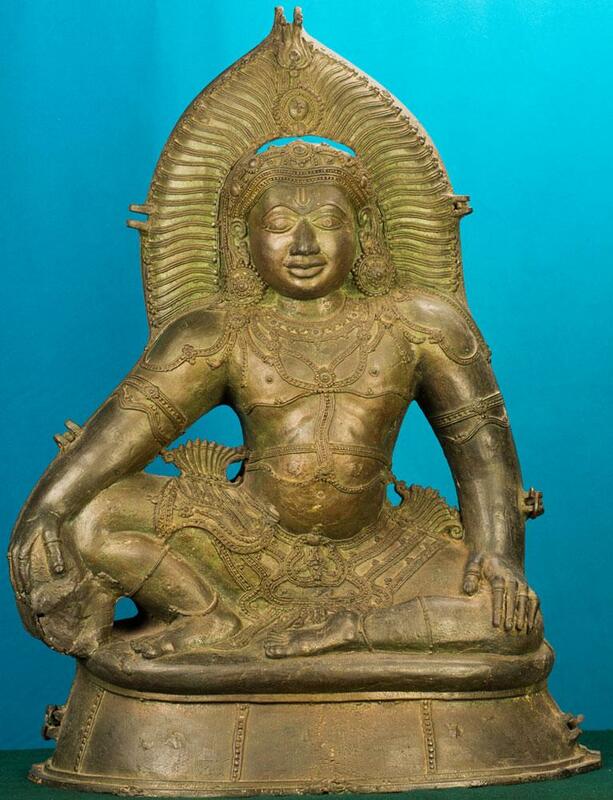 A majestic sculpture of Lord Sastha in typical Kerala style with two pieces hinged together. The Lord is sitting in maharajaleela pose and is adorned with sirachakra. Just above the forehead lie the beautifully designed ornaments. Every detail of this figure is clear. The forehead, the unusual arch of the eyebrows and the large prominent eyes show that this is not an early piece. The nose and legs are in the civilised form. Ratnakundalas are worn in the ears and an elaborate waist ornament adorns the figure. One peculiarity of the image is that there is no yajnopavita. The face is calm, serene and majestic. The figure with its elaborate shape of the body and broad muscles show that it is not very old.